Every chef appreciates receiving a replenishing batch of quality olive oil for their kitchen. After all, it is a major cooking staple. These jade green cake stands are so gorgeous that they double as dining room décor. Just add cupcakes and they’re a Pinterest-worthy present for your favorite entertainer. We are going through a never-ending obsession with all things marble. 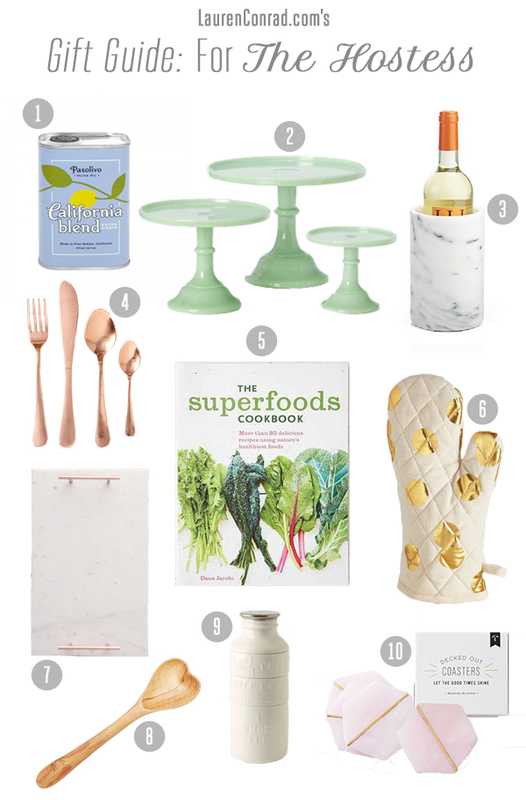 This chic wine cooler is an affordable and elegant gift. A copper flatware set is the perfect gif to give your favorite dinner party hostess. Plus, they add a unique metallic spin to your average silver utensils. For the cookbook fanatic—this superfood recipe treasure trove is a must-buy. You can never have enough little gold accents…even in the kitchen. Team LC fell in love with this gorgeous serving tray when we saw it in Lauren’s house the other day… So we figured, if Lauren has it, it’s a fabulous gift to give any hostess, too! Not only is this heart spoon made of stunning wild olive wood, it’s also made with love… A portion of the proceeds go towards families and communities in Kenya. This milk bottle measuring cup set will give any hostess’ standard measuring glass a run for its money. Pink marble with metallic gold lines—let’s just say these aren’t your average coasters. We’re also smitten with these gilded rim rose-colored glasses and these adorable arrow cocktail picks. Too cute! Which of these gifts will you give to your favorite hostess with the mostest?